Our strict quality control policies are one of the motivating pillars of our growing success that inspires us to offer high quality silicone fluid-based formulations. With the continuous development and improvement of quality applications, our products, especially silicone emulsions give us a cutting edge over the others. We pay utmost attention to the quality throughout our manufacturing process to ensure complete customer satisfaction. In addition, to ensure superior reliability, we dispatch these products only after they pass the defined quality parameters. We are a customer-centric organization that is dedicated to provide high quality products as per the clients’ requirements. Our team strives to enhance the product quality by exercising or implementing innovative ideas and latest trends to serve the increasing demands of several industries. In addition, we try to satisfy our customers by integrating product innovation, transparency and ethical business practices. We offer our product range in effectual packaging to ensure safe delivery. Additionally, we provide easy payment modes to our valued clients. This enables them to perform trouble-free transaction with the company. An ISO 9001:2008 certified company engaged in manufacturing, supplying and exporting of a wide variety of silicone based products. 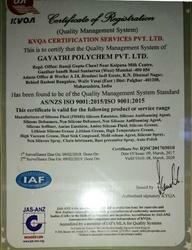 Known for the superior quality & effectiveness.